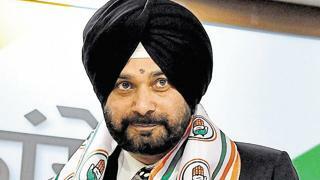 Sidhu's remarks on a press conference in poll-boundHyadabad, where he was campaigning for the Congress, kicked up a political storm back home as the Amarinder camp, former cricketer's statement to the untimely mood, in which he also said that Rahul, who sent him to Pakistan to attend the groundbreaking ceremony of the Kartarpur corridor Sidhu had gone to Pakistan even after Amarinder advised him against the visit. Punjab rural development minister Tript Rajinder Bajwa, a Sidhu-baiter and Amarinder loyalist, was the first to ask the Amritsar East MLA to put his papers if he suspects the leadership and capabilities of the Chief Minister. "Rahul is the captain of the whole Congress But Amarinder is the undisputed leader of the Congress The tone and body language used by Sidhu for the CM was humiliating and disgusting. He has no right to continue as a minister, "he said, adding:" Sidhu is a man in a hurry. He has high dreams But he needs to slow down and talk less, else he falls. " Endorsing Bajwa's stand, revenue minister Sukhbinder Singh Sarkaria said if Sidhu is not working as the minister, he should quit as minister. "I feel what Sidhu said does not behove a minister "By Saturday evening, two more cabinet ministers - Rana Gurmeet Singh Sodhi and Sadhu Singh Dharamsot - joined the anti-Sidhu clamour. Sodhi said Amarinder had announced as the CM candidate by Rahul before elections "If Sidhu feels the CM is not his captain, he should give up his position in his cabinet," he said. Dharamsot said a minister can not say he is answerable to the CM He went a step further and reminded Sidhu that he was not sitting in a comedy show. "In a comedy show, people laugh at such things. But running a government is not a comedy show, "Dharamsot said. Sidhu's resignation, Jail Minister Sukhjinder Singh Randhawa said his body language at the press conference was not right. "Showing disrespect to the CM can not be condoned in any government or party," he said. Sidhu, who is now campaigning in Rajasthan, press conference after the "Amarinder captain of the army" remark, stating that was made off-the-cuff. "But I stand by my statement that Rahul is both my and Amarinder's captain," he said. On the demand of ministers that he should step down, Sidhu said: "I am accountable to my conscience and the people of Punjab. I live in a space where the mind is free If someone distorts my statement, it is not my fault I have also said in the press conference that Amarinder is like my father. "